If you book your test before January 1st, the test fee will remain $299 CAD. The fee for additional Test Report Form requests will increase to $25 starting January 1st. If you request to send your IELTS test results to an institution before January 1st, each additional copy will be $20. 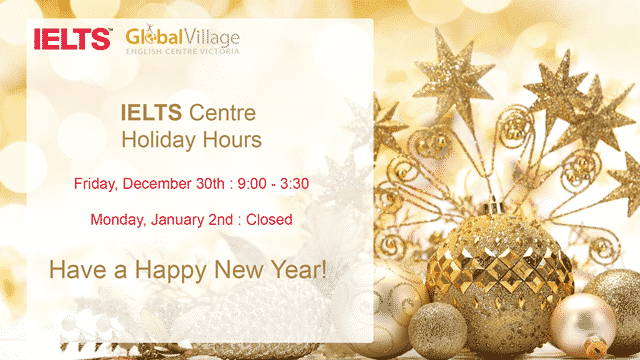 The IELTS Victoria office will be open on Friday, December 30th from 9:00 – 3:30, and will close on January 2nd for the New Years Holiday. Visit the Test Dates page to book your test online, or our Frequently Asked Questions page for more information about IELTS. We wish everyone a very safe and happy New Year.